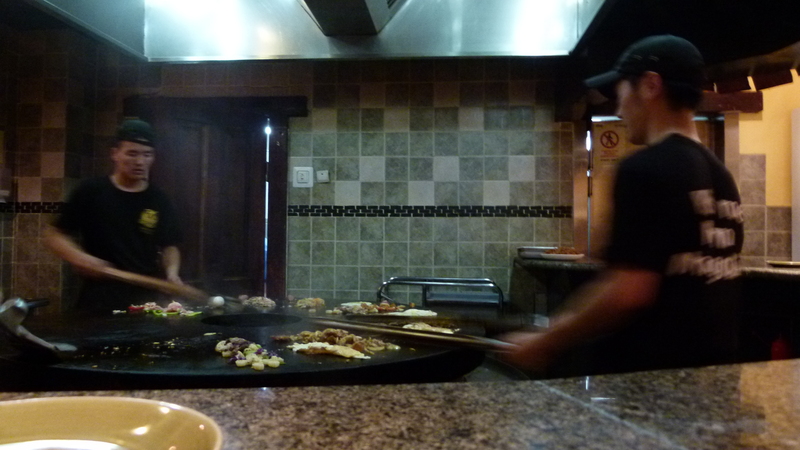 The authors of our guide books were not enthusiastic about the Mongolian food. Mutton, dairy products and nothing else. This might become boring when traveling for four weeks in Mongolia. Also, salted milk tea is something I cannot imagine to drink. Ursula and I decided to pack some crackers, some chocolate, some tea bags and some bouillon cubes to add a bit of variety to our diet. But… we did not need all this and we gave it away almost untouched, before returning home. We found the food not bad at all. 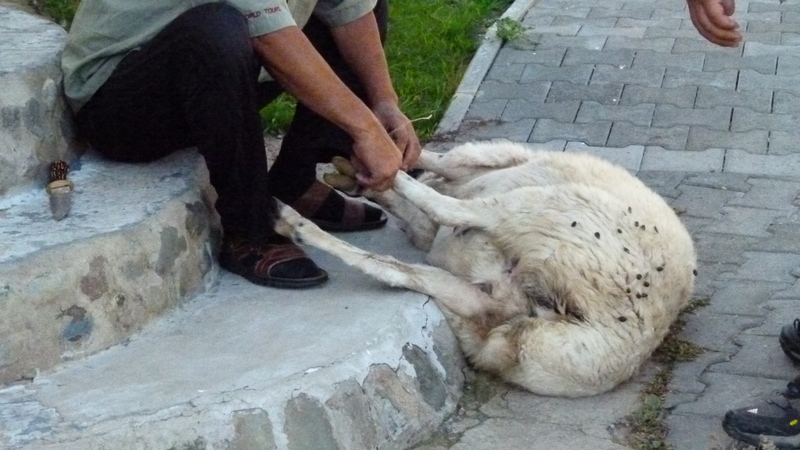 Mongolians love their animals though they eat a lot of meat. They try not to waste their lives and do not kill young lambs. They only slaughter older animals, and they do it very gently, as we could watch once. The man stroke the animal, cut into the abdominal wall (Bauchdecke) and then severed the artery to interrupt the blood supply to the brain. 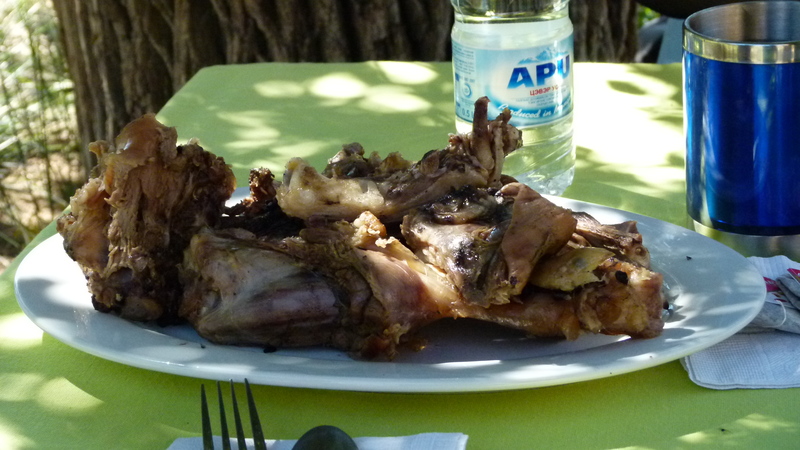 The mutton passed out within seconds (for a description in German see “wie ein Schaf in die Milchkanne kommt“). The most tasty mutton meal is Khorkhog. 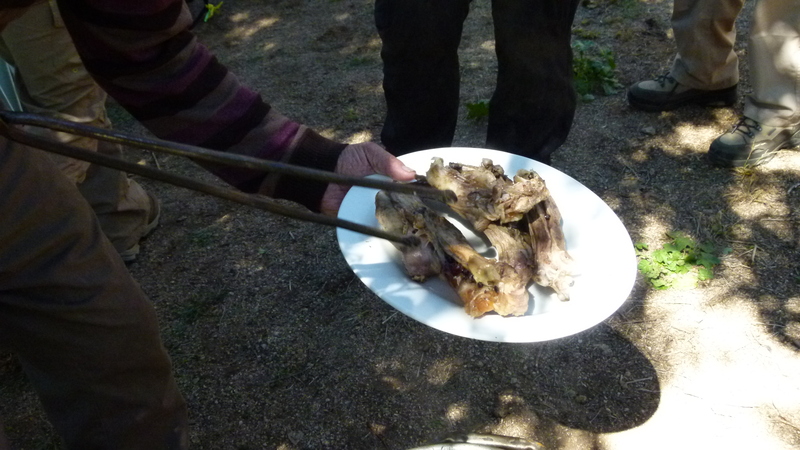 One of the two best Khorkhog meals was served to us at the Khövsgöl lake in the Deltur camp. The mutton simmered between hot stones in a metallic pot behind the house, while the gifted cooks prepared the side dishes on the small wooden oven in the kitchen. The second great Khorkhog was served by the Hoyor Zagal camp – it was a luxury picknick in the Khögnö Khpaan mountains – a real surprise. 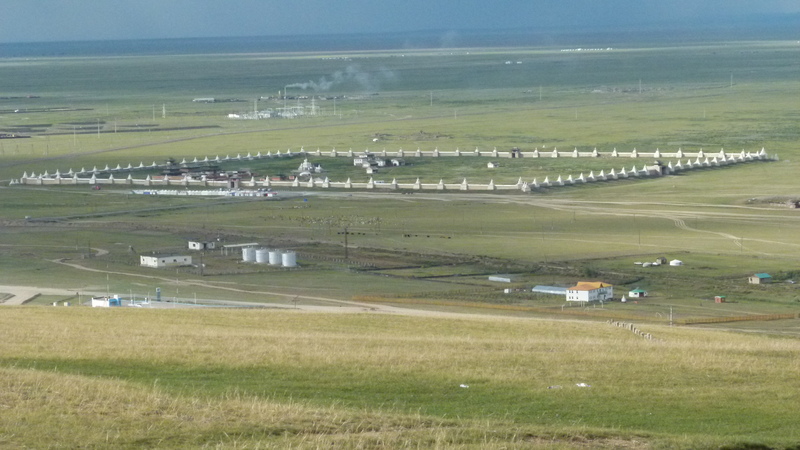 We felt like Chinggis Khan (the name of the camp reminds of his two white horses – “the two white ones”). Another tasty mutton meal are dumplings: Bansh and buuz are small and steamed (they are of different shape), while Khushuur are bigger and fried (we had them sometimes for our picknicks). See Mongolian recipes. Besides mutton, we had beef (I believe, sometimes from Yak) and chicken (which is perhaps more a compromise for the tourists). For four weeks, we had meat twice every day. After having returned to Switzerland, I did not eat any meat for about a week, and then I turned back to normal. 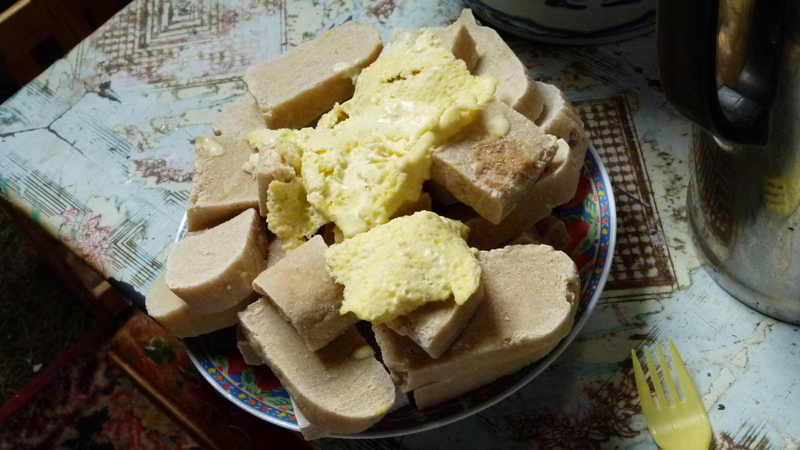 Dairy products are the second component of the Mongolian diet. We had yoghurt from Yak milk for breakfast and dessert. The nomadic families would always offer their cream and dried cheese made from Yak milk, when being visited. Airag is fermented milk of the female horse. 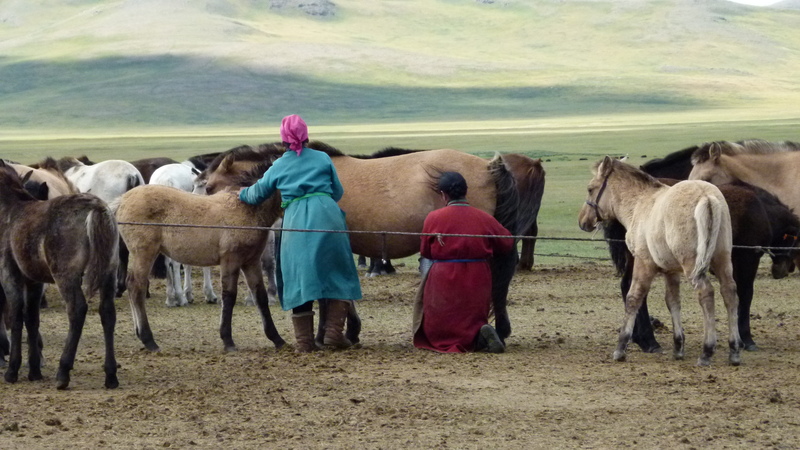 We were told that in summer the nomads almost exclusively live on Airag which contains vitamins. 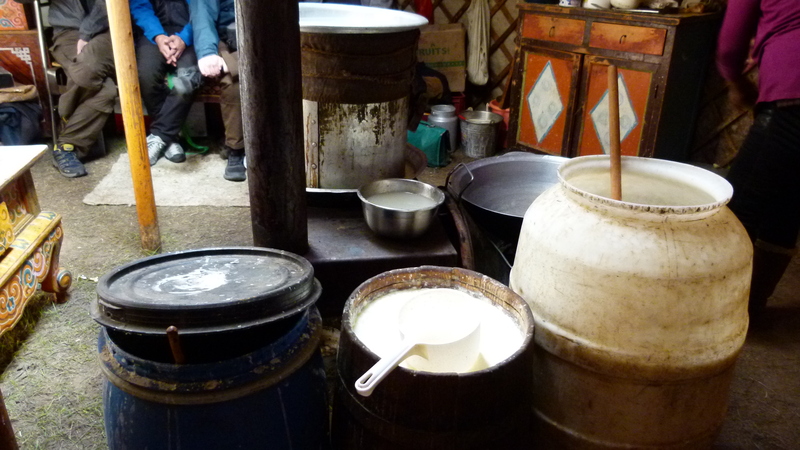 Some of us liked the fermented milk that we were offered by one of the nomadic families we visited. 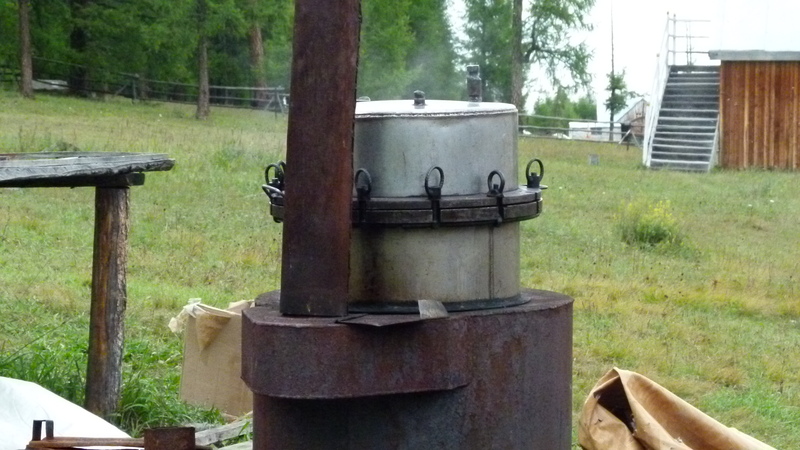 It is in the big white pot and has to be stirred regularly with the wooden muddler. We also watched how the mares are milked: One person has to hold the foal back and the second person is milking the mare. Breakfast was often a hot meal. 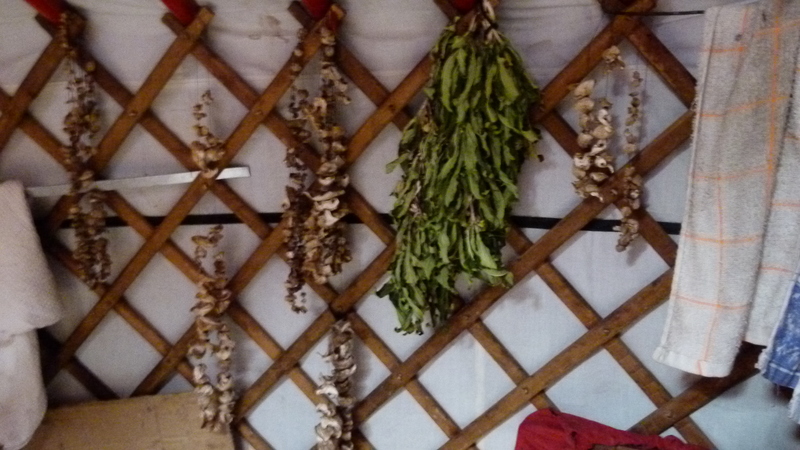 Most of the tourist camps we stayed in served eggs which are not part of the traditional Mongolian diet. 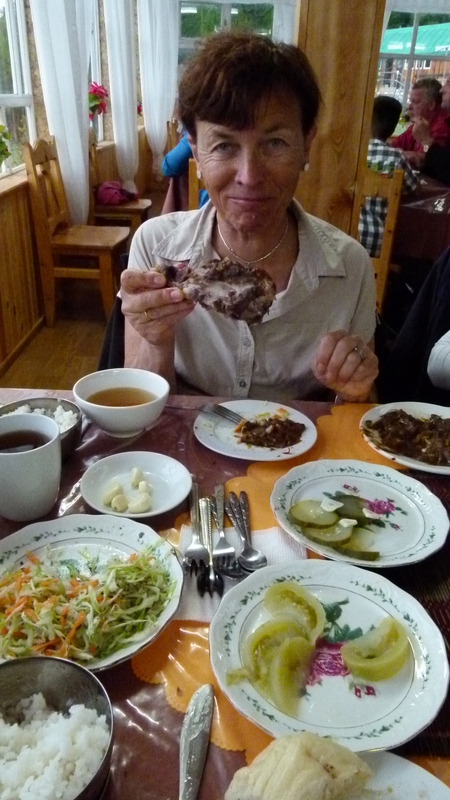 What we liked most was the mutton noodle soup (shölte khool) – it warmed us up after a chilly morning in the ger. The salted milk tea tasted much better than I expected, but we were thankful that we tourists also had the choice of black tea. The absolute breakfast hit were the bortzig. They are fried unleavened bread cookies and reminded us of our Schänggeli (a Swiss cooky). At the start of each meal, our Mongolian guide Jacqui would walk around with the salad plate asking “who can help me.” He had grown up in a nomadic family that had to withstand minus 40 degrees centograde in their ger in winter. All beyond meat and dairy products is just not nourishing enough to be efficient in that situation. Salad or vegetables are served to animals or to tourists and they are now on the menus of the restaurants in Ulan Baator. But a nomad guy simply cannot waste any energy to eat vegetables – this is food for the animals. On the Khövsgöl lake my eyes would flow over from all the mushrooms there – I had to be careful not to step on to them. I could have collected mushrooms without having to search for them. 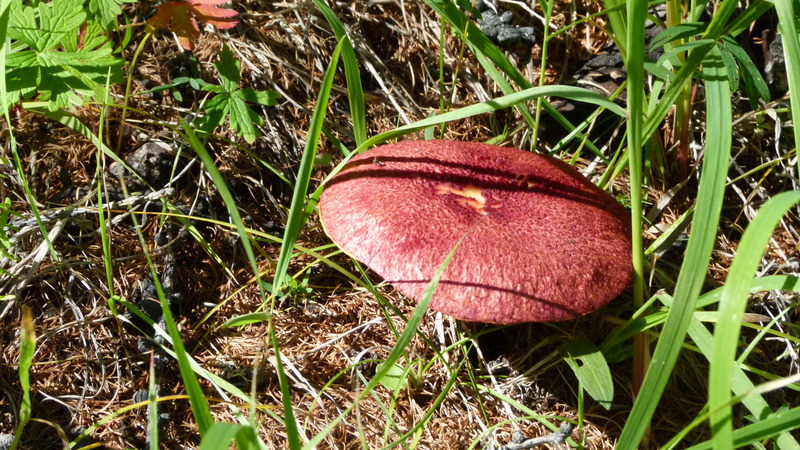 It was the first time in my life that I saw the boletus with the red hat – and of course many more boletus. I could have cooked a tasty Risotto for an army every day. 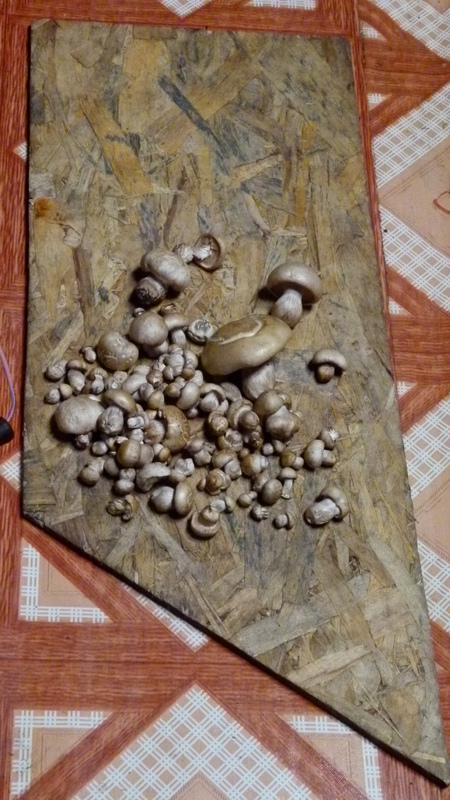 But the Mongolians do not bother to eat mushrooms. Not enough nutritive value. They dry some of them as a medicine for animals. Well, once I saw Pudje frown at a white mushroom on a meadow. And he was right. It was a death cap with the white lamellas. 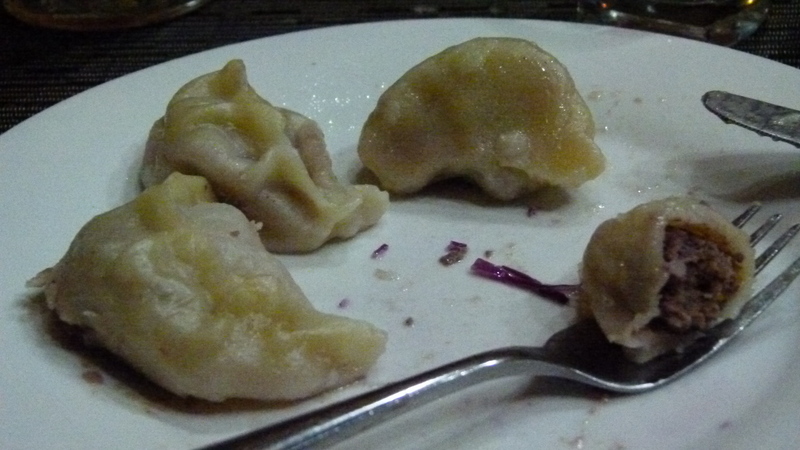 The Mongolians know their mushrooms, but they do not eat them. 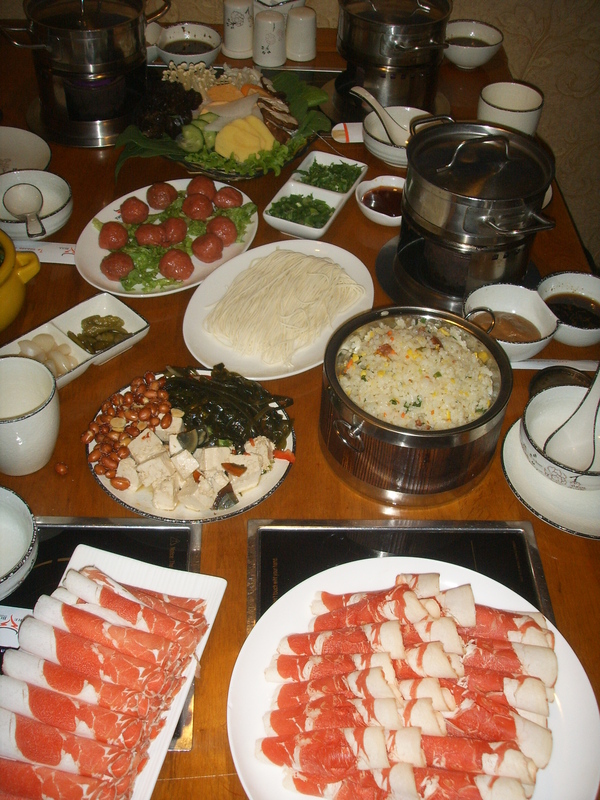 So, meat (above all mutton) and dairy products, this is the diet of the Mongolians. And it made them very agile fighters, when gathered by Chinggis Khan to conquer the world around 1200. They had the dried meat under their saddles and the mares’ milk was also with them. They had the basic food with them to nourish themselves while conquering the world. A mobile solution. The big baggage could follow later. Ulan Baator is becoming a world city with a lively restaurant culture. With Aika, we had a Mongolian firepot in the Bull. 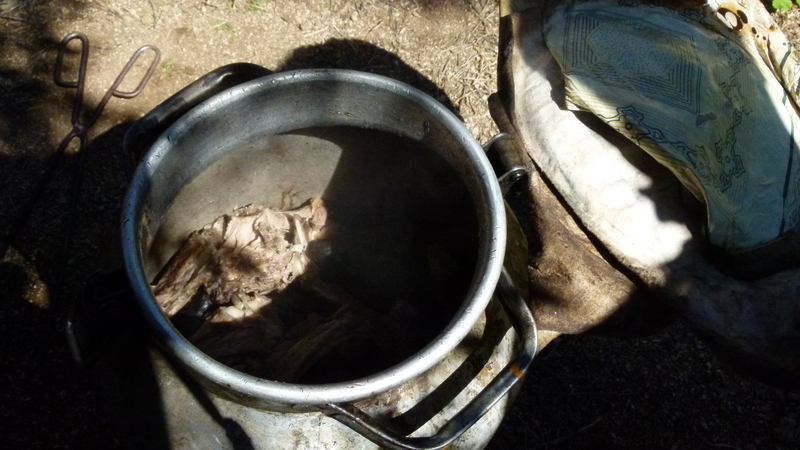 We cooked the meat and vegetables in our personal cauldron of boiling broth. 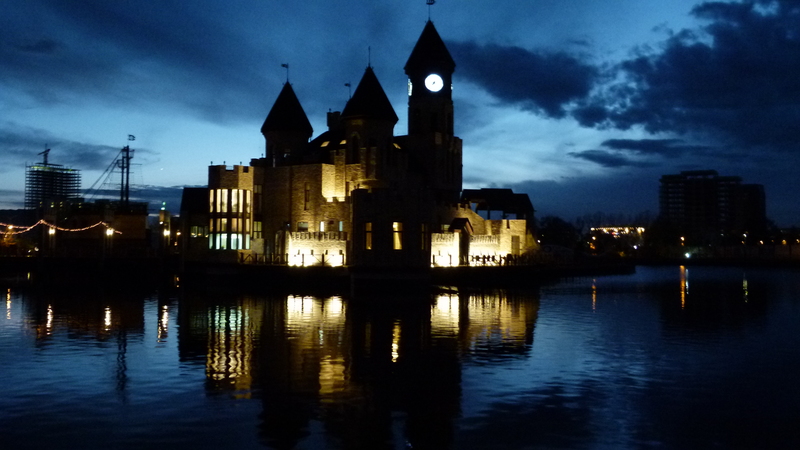 Matthias and Jacqui took us into a castle in Ulan Baator’s small Disney Land, where we could dream of princesses and princes. And for lunch they selected this restaurant full of activity, where the guests have to select the ingredients and then watch, how the cooks prepare them on the cookig stove – acting a real performance. Yes, Mongolia is changing quickly. Already half of the population is no longer agile nomads, but people living in cities. As I scan through the words, I expect to remember them easily, because Mongolian uses the cyrillic alphabet. Well, I experience an easy start – тийм (tijm) means “yes” and угуй (uguj) means “no”. It is exactly spoken as it is written. I move on to баярлалла (bajarlalla) – and the Mongolian voice of “uTalk Mongolian” says something like “bajrsa”. Hm… What about “good-bye”? Again I am confused – баяртай (bajartaj) is pronounced something like “baijsta”. Some other words are again easier such as yc (us – Wasser), утас (utas – telephone), суу (su – milk) and шар арайг (schar ajrag – beer, whereby I learn later that people say пив or “piv”). I also find a word for “please” – ажаммуу (adjamy). On the lake Khögsvöl, we share our language guidebooks with Aika, our local Mongolian guide and translator: “How can it be that “thank you” is written so differently from what it is pronounced.” Aika confirms that the pronounciation is correct and gently practices “thank you” over and over again with us: “Bajrla, bairla.” The “l/л” sounds almost like an “s”: Our tongues have to move forward and touch the teeth both for the “r” as well as for the “l-s”. Ursula with her language background from the Swiss canton of Berne soon gets this right, but my language background from Basel (with the French “r”) makes it hard on me. I think I never got it fully right, but I reached the level, where Mongolians gently understood me, when I was trying to say “bajrla” or “thank you”. They even answered, when I said өглөөний мэнд or “öglönij mend” for “good morning” and удшийн мэнд or “udschijn mend” for “good evening”. Then Aika tells us: Watch out the Mongolian word “us” is not equal to “us”! More hurdles. I was so proud to be able to ask for water or “us”. Aika laughs: “Careful, you have just asked for “hair” and not for “water”. “Us” with a short and closed “u” is “hair”. To ask for water, you have to say “uos”. This is one of the two vowels that do not exist in the Russian alphabet. The second one is “ө”.” Okay, I will remember the “uo” and the “ө”. This “ө” seems to be close to our German “ö” which makes it easier to be pronounced by us. Aika frowns at my App uTalk: “Nobody says “adjamu” for “please” in Mongolian, this is old fashioned. “Please” is part of the verb that we ask for – we add “yy” (uu).” I give up on “please”, as I will never be able to learn so many verbs to be able to politely express “please” with each of them. I hope the Mongolians will forgive me for that. And why is this App “uTalk Mongolian” getting this wrong? I am disappointed about its wrong teachings. On our Wikinger group tour, Matthias gives us an excellent introduction into Mongolian. He is our German guide with Mongolian roots and he is kindly assisted by Jacqui, our engaged and lively Mongolian guide. Like Hungarian and Finnish, Matthias explains, Mongolian is an agglutinative language applying the harmony of vowels (only “harmonious” vowels are combined in one word… I remember the words with many “ö”and “ä” in Hungarian and Finnish). Also the grammar is related: Prepositions such as “with” are embedded into the noun. Verbs have an ending that makes them more or less “polite”. Mongolians even have a word for the question mark and say it explicitly. By having been in touch with the Turkish culture, Mongolians also use some words related with Turkish, but Mongolian and Turkish grammar are different. My Swiss newspaper NZZ (October 8th) underlines the relation between Finns and Mongolians from the opposite angle: In the 19th century, the German philosopher Ernst Häckel spread the stereotype that the Finns are Mongolians and differ from the Aryan race that the Swedes belong to and some Swedish researchers followed him. Racism is a sad background, but this fact shows that also the Finns (and their neighbors) are aware of their relation with the Mongolians. Masch sakhen bailaa (it was great). Ikh bajrla (thank you very much). Darajil masch sain tschultschen ultschlere (have more nice tourists). Matthias and Jacqui, why do you not create an App for tablets that has no mistakes, gives some background information and focuses on what is important? And, PONS, would you not also offer a dictionnary Mongolian to German (to English would also be okay) and sell it as an App? In my blog I might not get everything right when trying to make some steps into Mongolian – I will be happy to learn and improve. Matthias told us that many who visited Mongolia came back again… and perhaps I will do so as well! From history we remember that peoples came from the east (Asia) to conquer the world. And they were often cruel with those that opposed to them. We remember the Huns and Turkish tribes. We remember the huge wall that the Chinese built, because they were afraid of the Mongolians… We remember the golden circle of fortified monasteries that the Russians built around Moscow as a protection against the golden hordes. Yes, the peoples from the steppes came to conquer the world. And Chinggis Khan is present in Mongolia’s memory today, as here in front of the Parliament House in Ulan Baator. 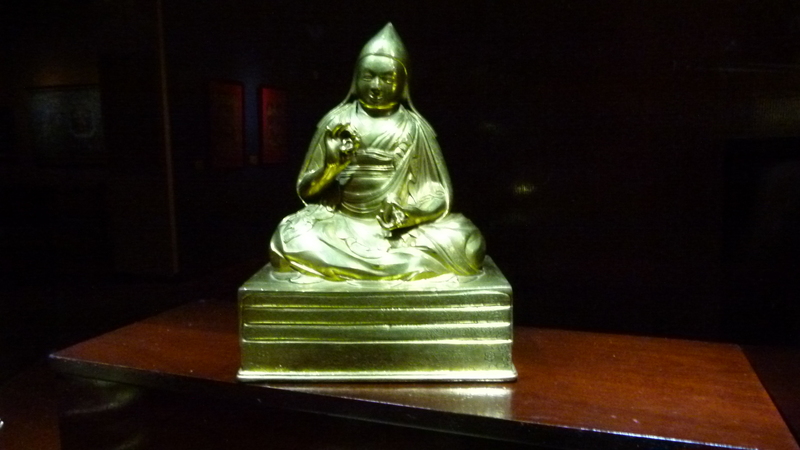 In 1578 Buddhism came to Mongolia, influenced by the Tibetan monk Sonam Gyatso. It was the Tibetan Mahayana tradition, the so-called Yellow Hats. Two Mongolian leaders took the initiative, Altan Khan and Abtai Sain Khan. 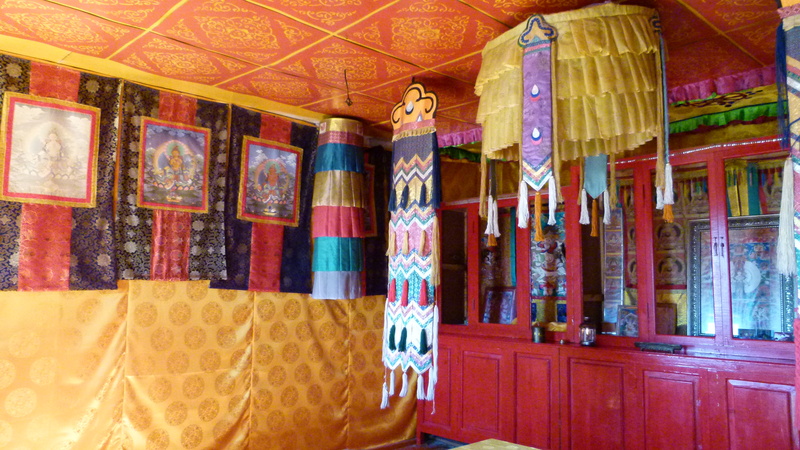 The tradition of Lamas started with Sonam Gyatso. Yes, the conquerors became the most religious people in the world: Eventually 50% of the male population in Mongolia were monks living in about 700 monasteries. This is thought to be largely the impact of Zanabazar (1635-1723, see also my blog about Zanabazar). 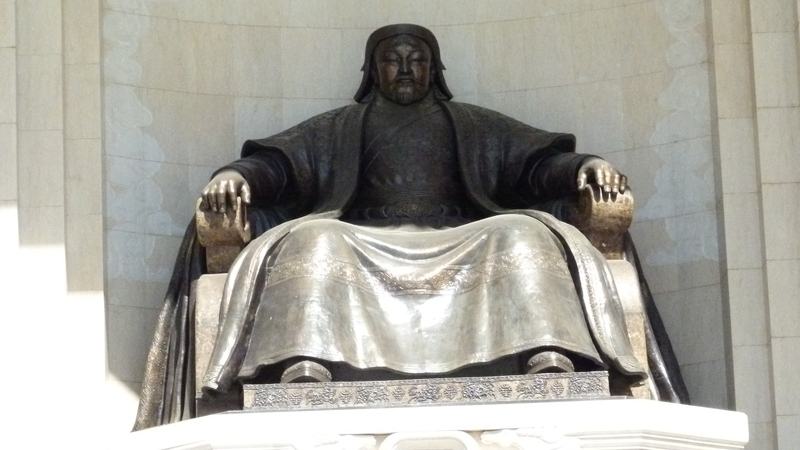 He became the first religious and political leader of Mongolia, called Bogd Ghan (or Gepan). He was not only a leader, but also an admired artist and a scientist – some call him the Leonardo da Vinci of the steppes. 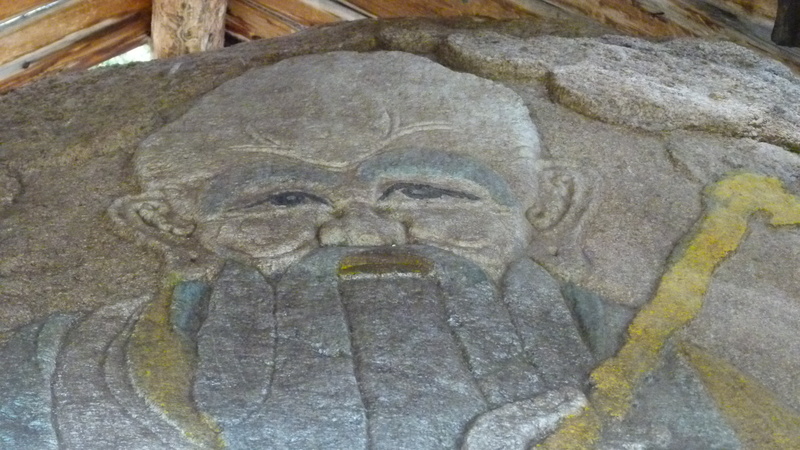 This is his self portrait exhibited in the Zanabazar museum. Zanabazar had serious political challenges: The Oirats (his enemies in Western Mongolia) conquered Eastern Mongolia and the Khalk tribes. Zanabazar fled to China and then defeated (and extinguished) the Oriats with the support of China. 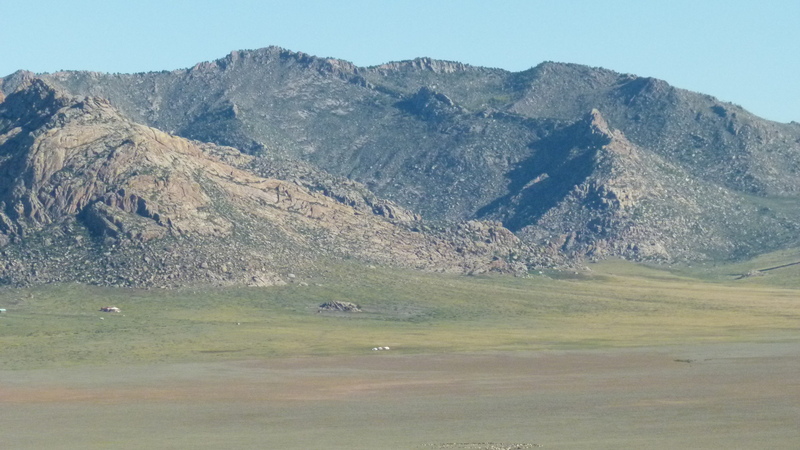 Under Chinese rule Mongolia lived a period of relative peace. 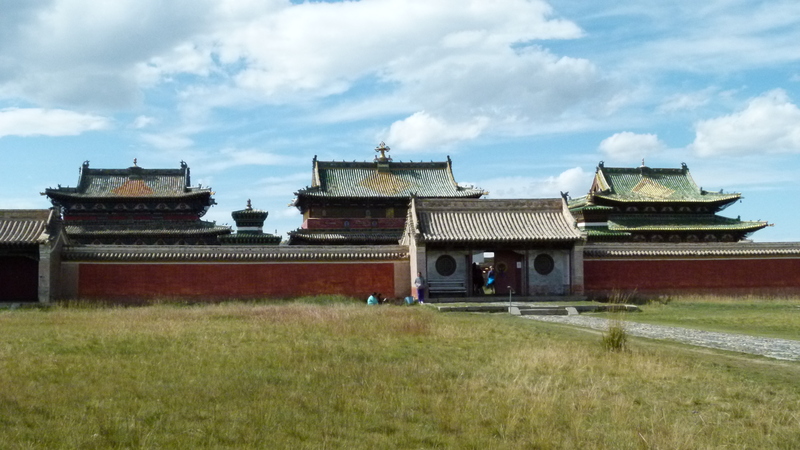 It was then that the Mongolians became religious with 700 monasteries. In the 1930-ies, this was a no-go for Stalin… and he destroyed most of the monasteries and murdered many, many monks, with the support of Choibalsan, the Mongolian leader that was loyal to him. Erdene Zuu was the first Tibetan Buddhist monastery in Eastern Mongolia (see wikipedia). 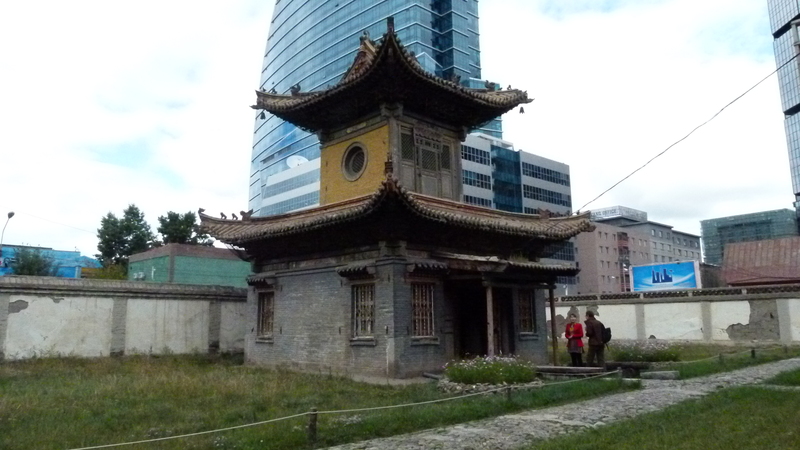 It was built in 1586, reusing the remains of the destroyed old Mongolian capital Kharkhorin. Up to 1000 monks lived here. After the 1930 purges, the wall with 108 stupas has been protecting a largely empty area. 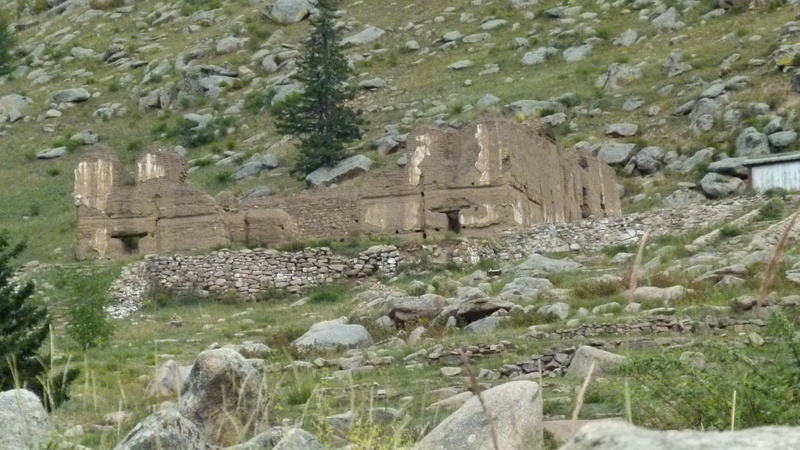 Three temples remain within an enclosure. 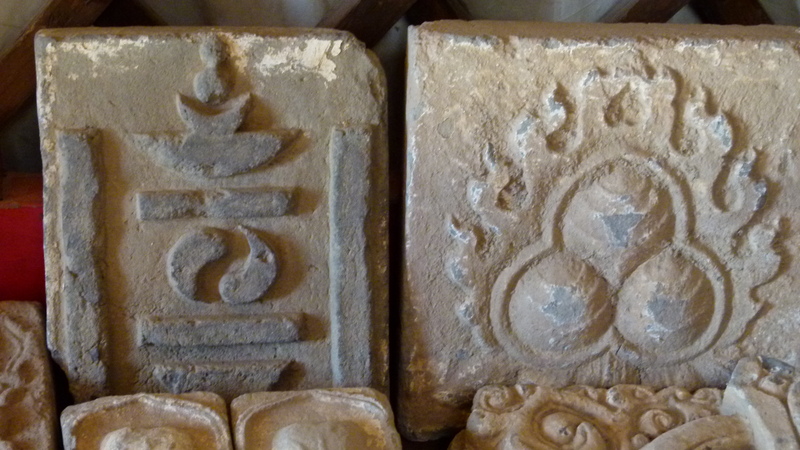 One temple is for the young, one for the adult and one for the old Buddha. 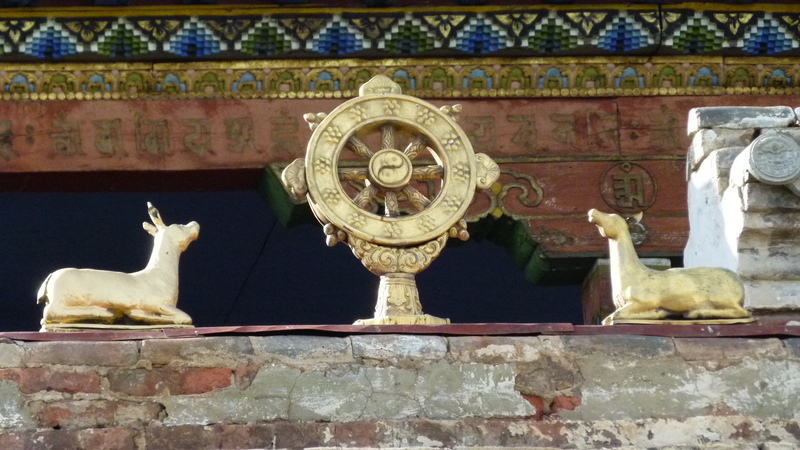 The wheel with the gazelles remind us of the grove, where Buddha revealed his cognition to his disciples and the animals. 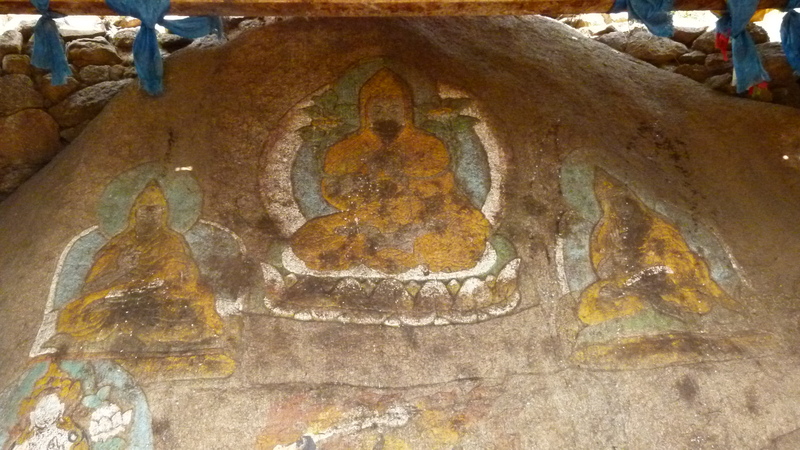 There is also a white stupa inside the stupa wall. 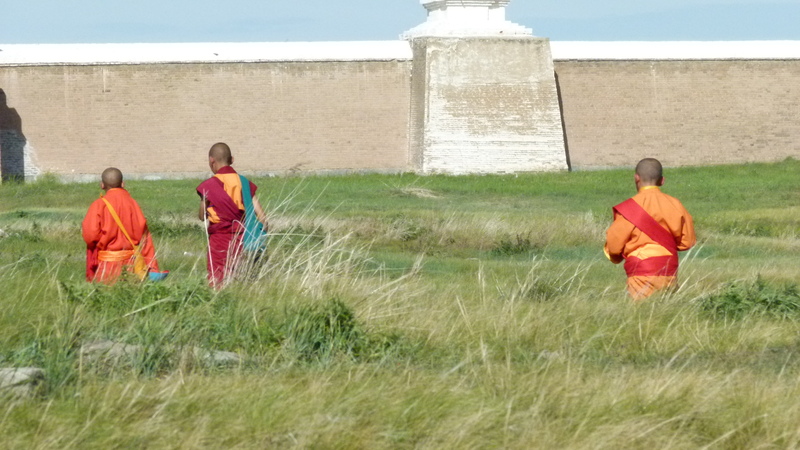 Today Erdene Zuu is reviving: Monks are again singing their morning prayers in a newer temple. 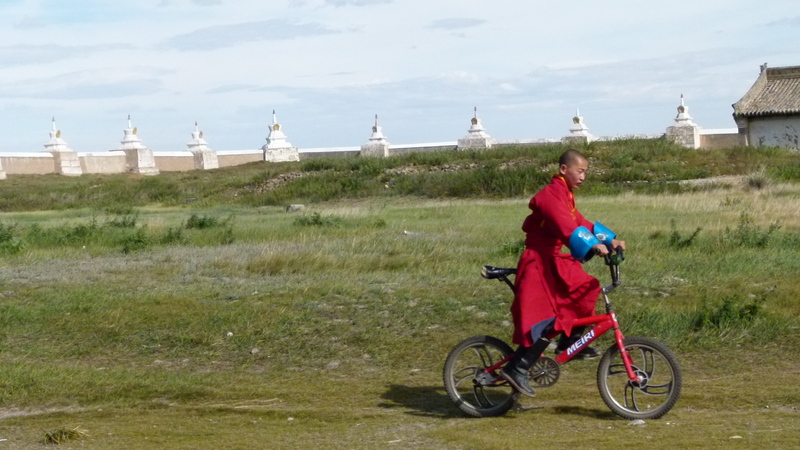 We met some monks in the area – also a young monk on his bicycle. 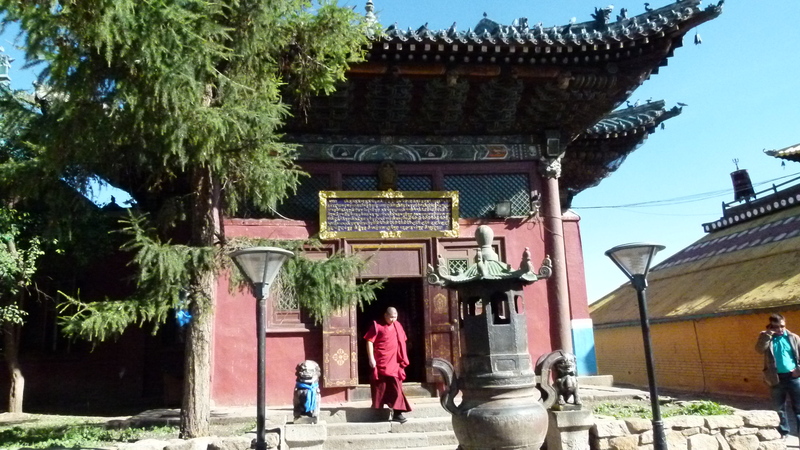 The Gandan monastery on a hill west of the Ulan Baator city center was built in the first half of the 19th century. It was a learning center for Buddha’s teaching and has mostly escaped the purges under Stalin, because it is said to have proved the diversity of the Soviet Union (see wikipedia). There is a large temple with a huge Janraisig statue (26m, rebuilt in 1996) and there is an inner circle wall with smaller temples, where the monks are singing their morning prayers, directed by the vashra (thunder bolt) and the bell in the hands of one monk, and from time to time accompanied by the gong. We attended the solemnel prayers for some time. And then joined the pilgrims rotating the prayer wheels. 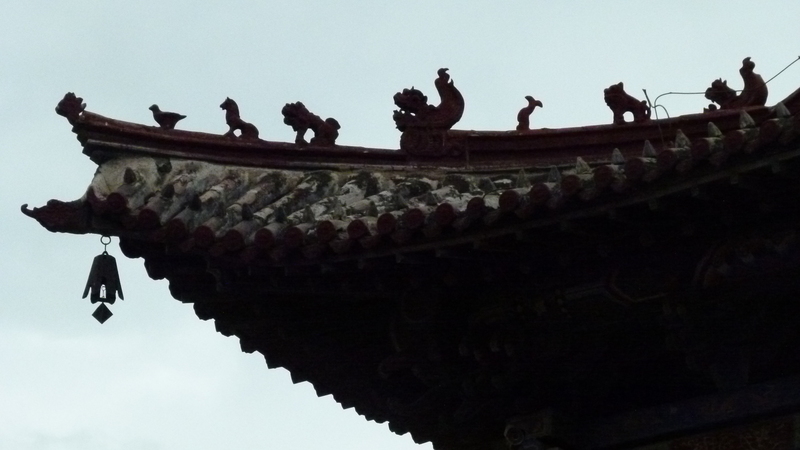 The Choijin Lama Temple was built in 1904. It had been saved from the Stalin purges, as already then it was a museum (see wikipedia). It is a peaceful oasis surrounded by sky scrapers. 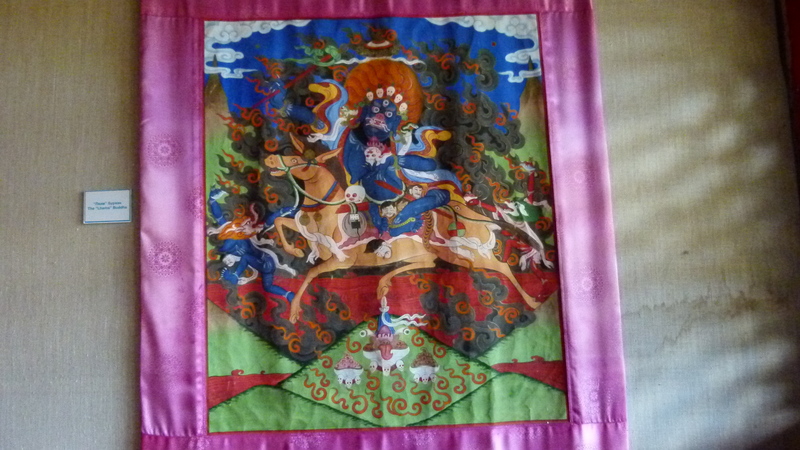 Five temples show statues of the historical Buddha (Sakyamuni) and of religious leaders (also a self portrait by Zanabazar) as well as thangkas (religious paintings on cloth; here is Shakyamuni from the Zanabazar museum) and tsam masks (used for dancing during religious ceremonies). My head turns, as the charming museum leader explains all the symbolism that supports the Buddhists to reach the state of enlightment. I now understand that the nasty looking guards are in charge of protecting the holy temple and keep all bad demons outside of it. Sadly, inside the temples we are not allowed to take fotos. 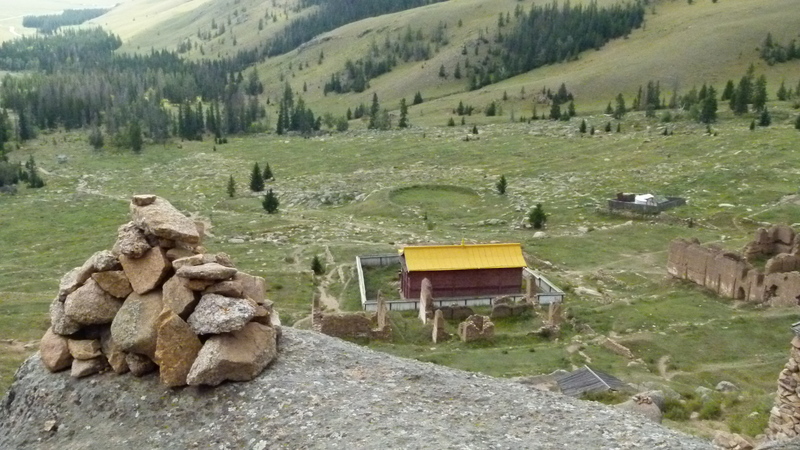 In the mountains about 30km south of Ulan Baator, on 1645m, the Mandshir/Manzushiryn Monastery – built in 1733 – once hosted 300 monks (see wikipedia). The site is gorgeous – pine forest and pastures that remind us of our Pre-Alps in Switzerland. 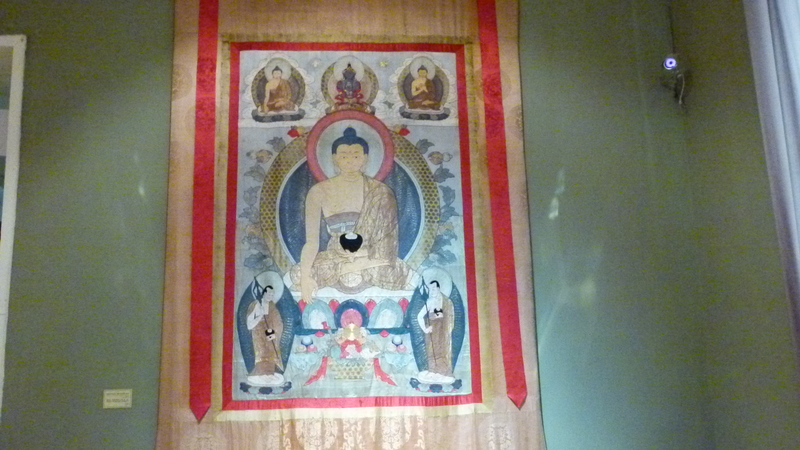 The main temple has been restored as a museum – again we find the thangkas (silk cloth) and the tsam masks. In detail we study Shri Devi, the guard who became female to marry the demon she wanted to fight. She sits on a mule, the skin of her husband-enemy is her saddle and she is killing her baby. This is a very gloomy story. 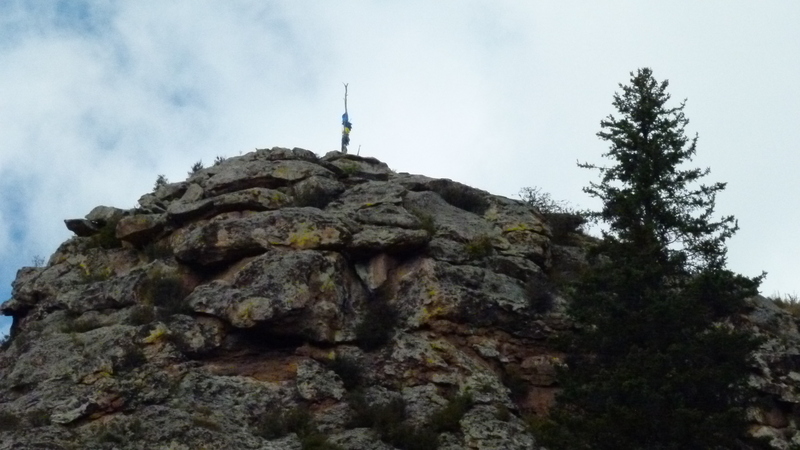 Shamanism meets Buddhism… With Aika we climb the rock above the monastery, say hello to the Ovoo on top of the rock and enjoy the view. Aika sings a song – it is the first time that she climbed this rock. On our way to Kharkhorin, we take a break to walk in the Khögnö Khpaan Mountains. There are two monasteries here, known under the name of Övgön (see Trescher Verlag and Lonely Planet). 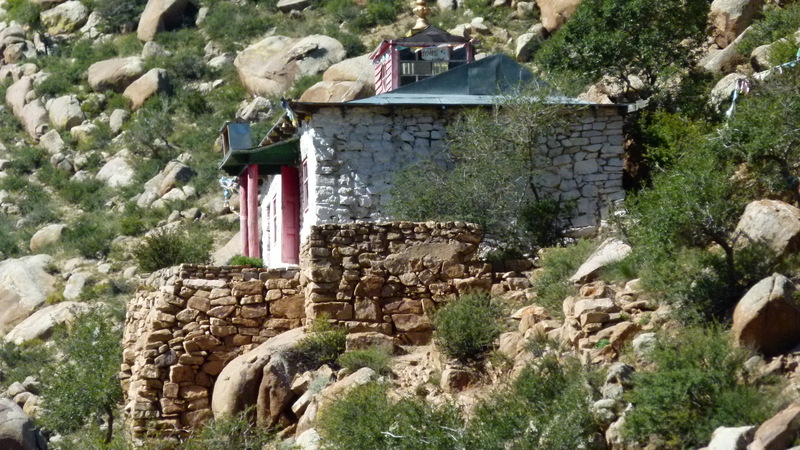 The first and older monastery is nicely hidden away in the mountains. 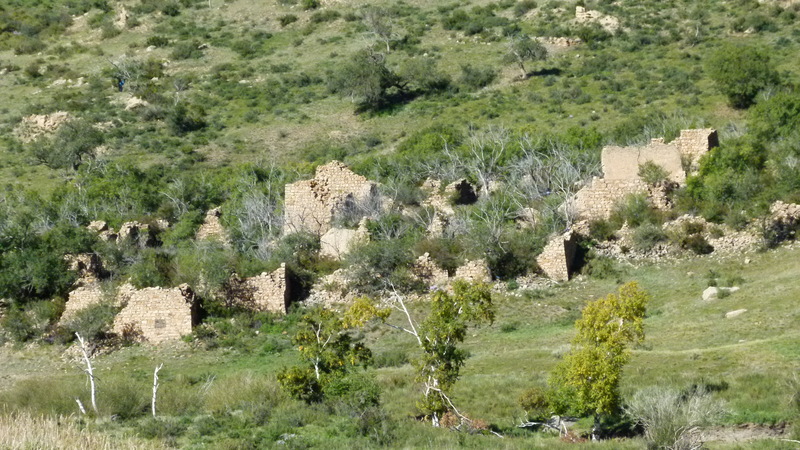 Only ruins are left. 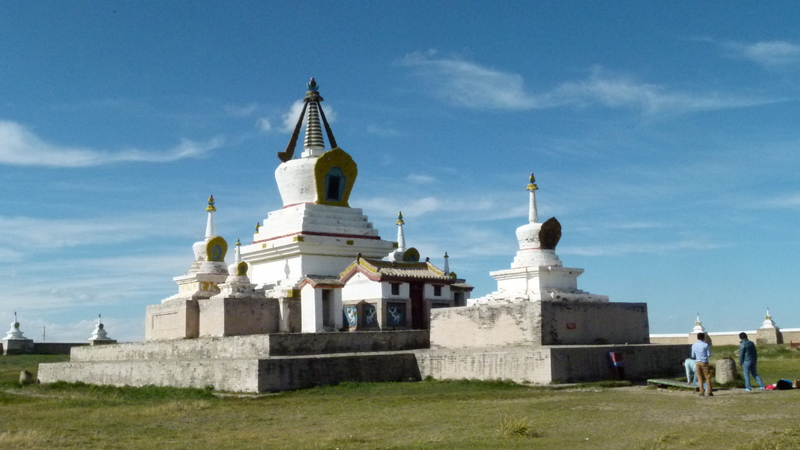 It has been destroyed in the 17th century during the turbulences between the Oirats and the Khalk Mongolians. 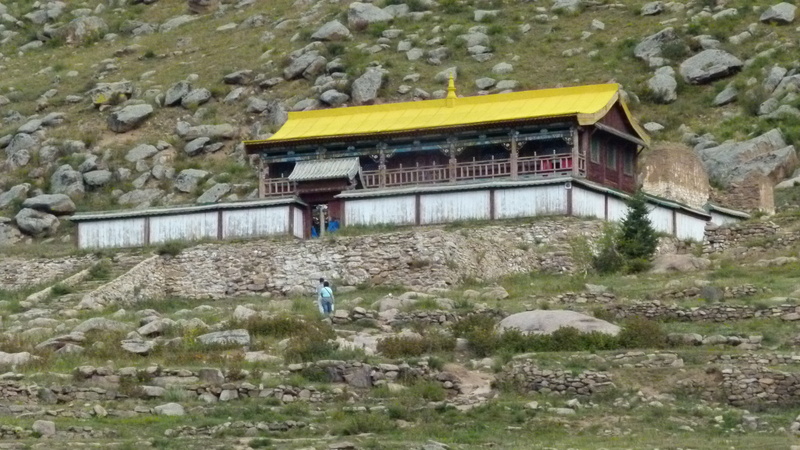 It is controversial, when this first monastery has been built. Some sources say – in the 14th century by the red hats, others say – in the 17th century (then already by yellow hats). 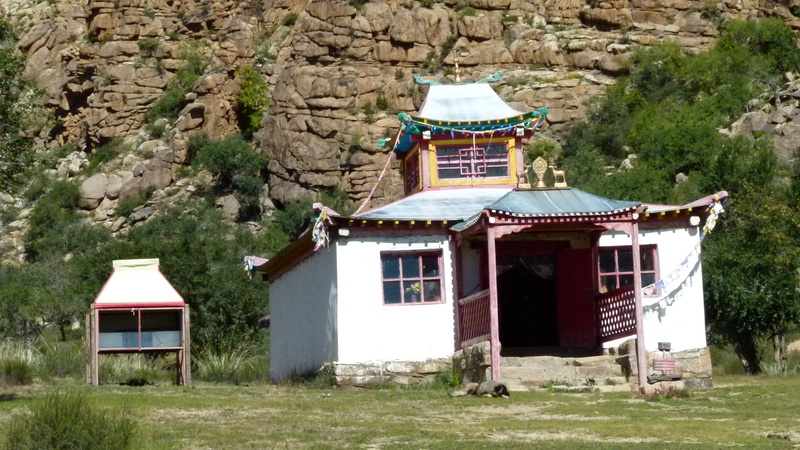 The second Övgön monastery is at the foot of the Khögnö Khpaan Mountain range. It has been destroyed during the Stalin purges, and now it is reviving with female monks. 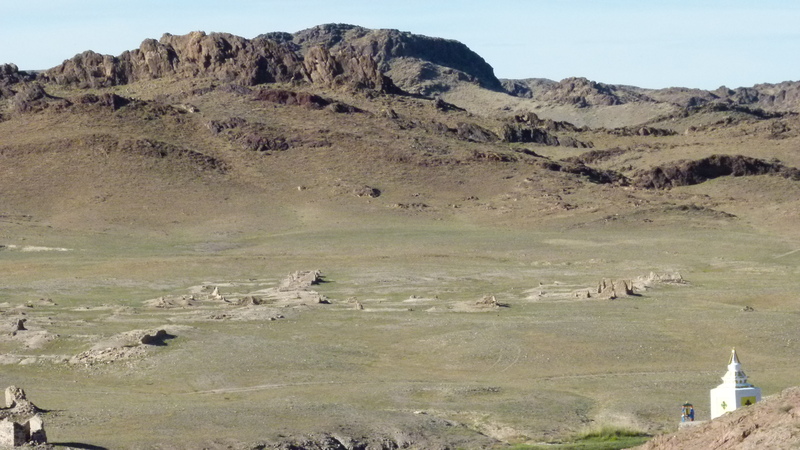 Ongi Gol allows for a ribbon of fertility in the desert of Gobi. 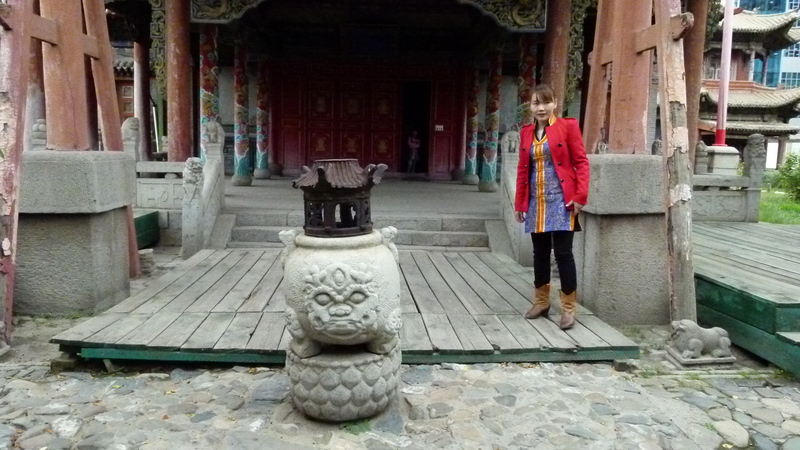 We visit two monasteries here. 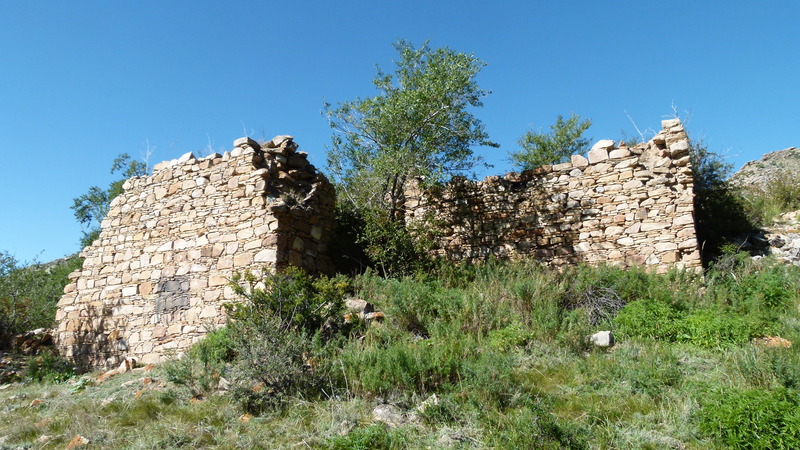 They have been destroyed in the 1930-ies. 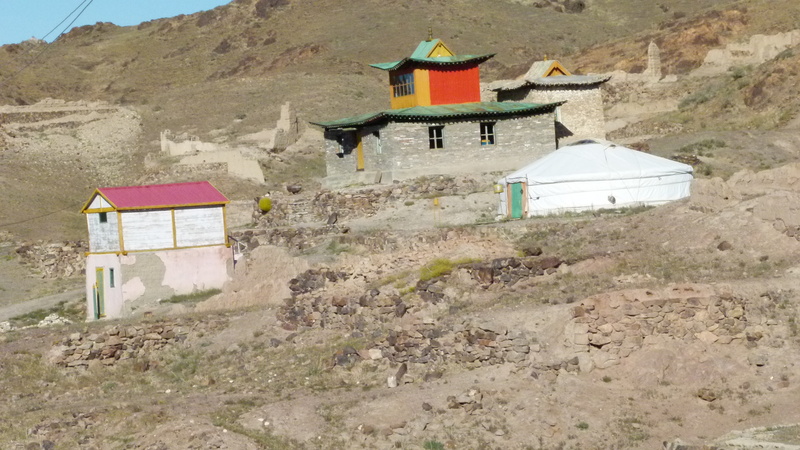 The southern monastery has now partially been rebuilt and is reviving (see wikipedia about this khiid and the nearby ovoo). 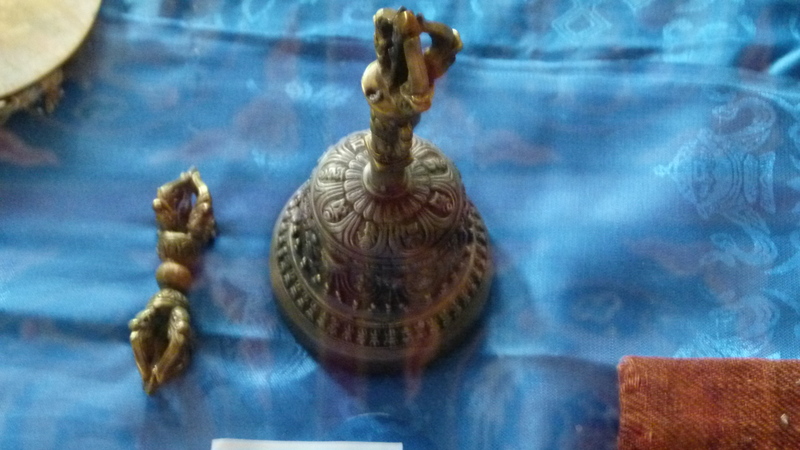 There is a museum hosted in a ger that shows religios artifacts and tools supporting the life of the nomads. The site provides holy water – Matthias pulls up some of it from the underground well for us. Refreshed we start a long walk through the hills from here. 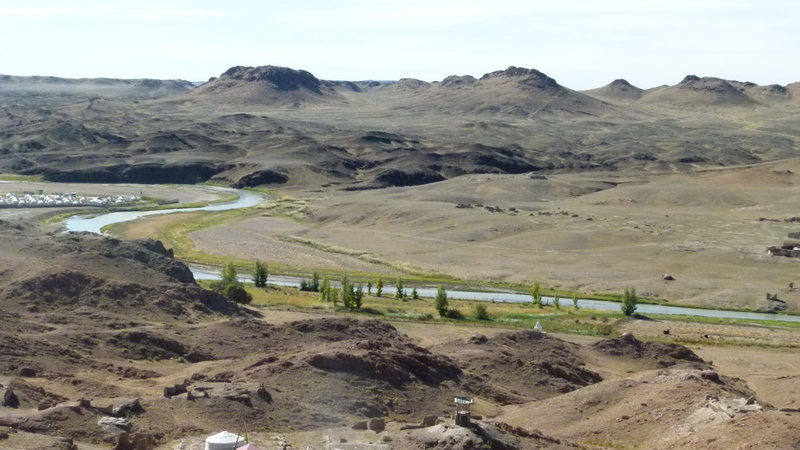 Oh yes, we discovered hidden treasures in the Mongolian steppes and desert. 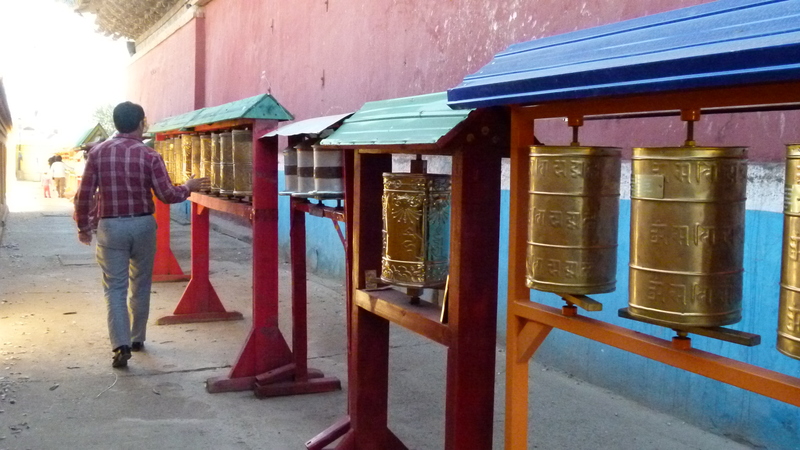 There is more to Mongolia beyond warriors. Sources: Internet, Marion Wisotzki et alii, “Mongolei”, Trescher Verlag 2010; Michael Kohn et alii, “Mongolia”, Lonely Planet; information given by Matthias, the Wikinger guide; various Internet sources.